Welcome to Day 3 of our blog hop with Lawn Fawn design team! Are you enjoying the wonderful inspiration shared by both talented design teams? If you missed Day 2, visit Blog Hop with Lawn Fawn Day 2 and for Day 1, and Blog Hop with Lawn Fawn Day 1. Stay tuned for prize giveaway details at the end of the post! It’s fun to be blog hopping with Lawn Fawn today! For my project, I used some bright papers from Lawn Fawn’s Perfectly Plaid Petite Paper Pack to make a Butterfly Card and coordinating notepad. The butterfly and verse are from Lawn Fawn’s Flutter By stamp set. Each was stamped and heat embossed with white embossing powder and then colored with markers. I used E-Z Dots® Permanent Refillable Dispenser to fasten papers to white card. The butterfly is fastened with Dodz Adhesive Dots Mini and 3D Foam Squares White Small to pop up the wings. I added white dots along flight of butterfly, antennae and stitches on paper band. The little notepad is covered with same bright papers that are fastened with Adhesive Sheets 6 x 12ʺ. The butterfly is stamped and colored same as the one on the card and is also fastened with Adhesive Sheets 6 x 12ʺ. Faux stitch lines accent the edges of notepad flap. It’s a fun card and mini notepad gift to brighten someone’s day! 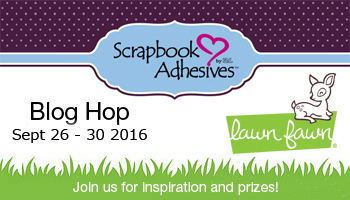 I’m delighted to be partaking in the Lawn Fawn and Scrapbook Adhesives by 3L® blog hop. Such a lovely choice of stamps, papers, inks and more. Being a fan of all things dotty I was immediately drawn to the Let’s Polka in the Meadow – Collection Pack and I couldn’t resist Sophie’s Sentiments – just a brilliant collection of useful stamps. 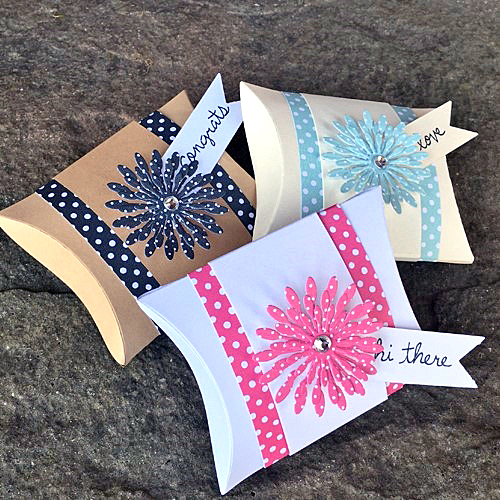 My project is decorating three mini pillow boxes, ideal for small gifts or table favors. Using the Let’s Polka in the Meadow – Collection Pack, I chose three colours that coordinated well and cut strips to wrap around the pillow boxes. To affix into place I used E-Z Runner® Micro Permanent Strips Dispenser – this dispenses a fine strip of adhesive allowing me perfect precision. I die cut some flowers and stamped some tags with Sophie’s Sentiments. Positioned and then secured these in place with 3D Foam Squares White Regular. I don’t think 3D Foam Squares ever leave my craft desk! Easy projects to make and so effective with the beautiful paper and stamps. Blog Hop with Lawn Fawn – Day 3. Enter to win by leaving a comment through the Rafflecopter App. A winner will be randomly picked. International entries are welcome. This entry was posted in 3D Foam Squares, 3D Projects, Adhesive Dots & Lines, Adhesive Sheets, Adhesives, Announcement, Cards, Crafts & Tutorials, E-Z Runner® Dispensers, Gifts, Party Favors and tagged 3D Foam Squares Mix White, 3D Foam Squares Regular White, 3D Foam Squares Small White, Adhesive Sheets 12x12" (25 sheets), Adhesive Sheets 12x12" (5 sheets), Adhesive Sheets 4x6", Adhesive Sheets 6x12", Blog Hop, Card, Christine Emberson, E-Z Dots Permanent Refillable, E-Z Dots Refill Value Pack, E-Z Runner Micro Refillable Dispenser, Gift Box, Judy Hayes, Lawn Fawn, Pillow Box, Tsukineko. Bookmark the permalink. 38 Responses to "Blog Hop with Lawn Fawn Day 3"
Oh my goodness Judy and Christine, these are so lovely! Such cute projects! Beautiful projects! The pillow boxes are so sweet! Lovely projects! I love the idea of a card and matching note pad!! What fun projects and gift giving ideas. Love this plaid from Lawn Fawn. What fun ideas – love the idea of a magnetic closure for a notepad cover! Oh wow!!! !All these creations are too sweet and cute!!! Great job ladys!!! Love these!!!! Pretty projects today! I always love the prints of the Lawn Fawn papers. Love the projects and the beautiful papers! Judy’s card and notepad and Christine’s pillow boxes are fabulous! Great collaboration with Lawn Fawn products! Oh wow! So much lovely inspiration!!! I love the plaid and the polka dots!!! What great projects!!! Love the inspiration and learning about the adhesives you offer! I’ve made so many pillow boxes. They are so versatile. colorful. Whoever gets them will be thrilled. Love the projects! I’ve never made pillow boxes before, but those are really cute! Such cute projects is why I love hopping! Fantastic projects! I love making notepads. Adding this one to my stash of inspiration. Great crafts, I love all the box designs. Your projects today are fantastic. Love the plaid. set and the pillow boxes are so pretty. I always love seeing cute treat boxes and bags and those pillow boxes are adorable. Love the plaid note pads too. I’m always excited when I see giftable projects and both of you ladies gave me wonderful projects to be extra excited about tfs. Love the Lawn Fawn projects, so cute! Nice prints on the first project and I really like the flower die cut on the other card. I like to see me ideas and be introduced to new companies I may not know about. Oh my gosh! The plaid! The plaid! I am mad for plaid. It’s gorgeous. The pillow boxes are darling too. Those are some cute projects. I especially like the little notecards. Thanks for sharing. Wow! The first projects are so colorful! Love Lawn Fawn! Love the butterfly notepad and card. Just lovely projects. I love all the details and patterns. Just marvelous!!! What I love about blog hop, we get a lot of inspiration and that’s amazing!!! Please make a video of how you did that notepad… I LOVE it. Those papers also happen to be my favourites… Great work! 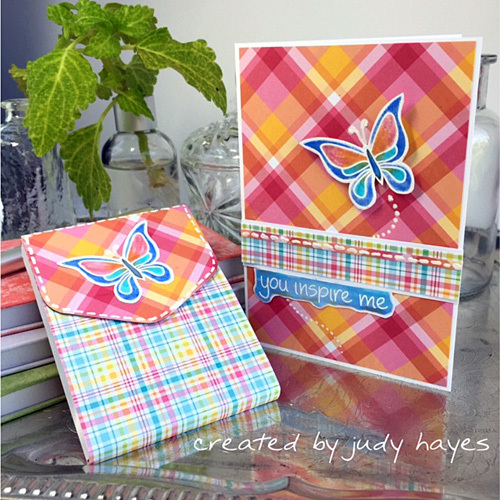 Awesome projects, the butterfly notepad and card are fantastic! LOVE the CHEERY butterflies and flowers, LOVE the PRETTY yet PRACTICAL notebook and the SWEET pillow boxes too!!! love the notebook and matching card, and the beautiful pillow boxes! Judy and Christine are really awesome!